I’m not sure “ephemera” is the write word to use for this post, but it’s the one that seems to fit the best. 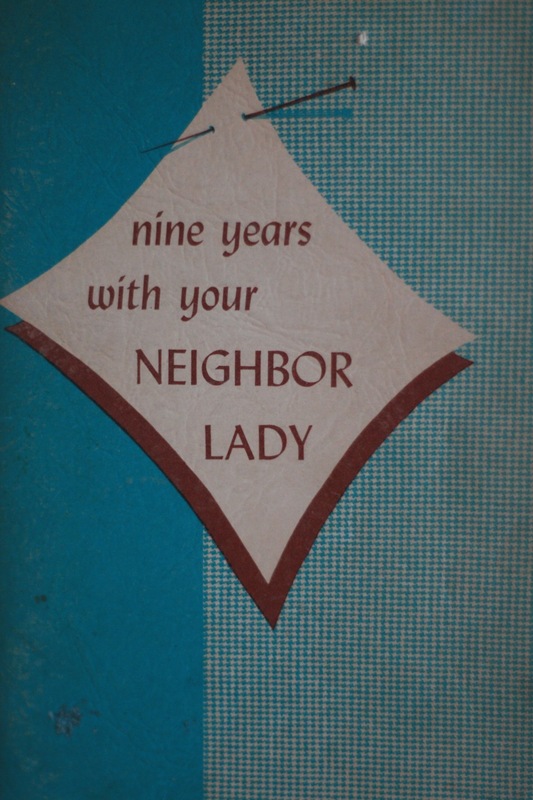 By “ephemera,” I’m talking about bits of writing that I find in books, particularly the WNAX Neighbor Lady cookbooks that I collect. I’m fascinated by “found art,” if that’s a better term for it — bits of writing or drawings in books that were probably never meant for anyone else’s eyes. When I find some, it makes that book even more special to me. 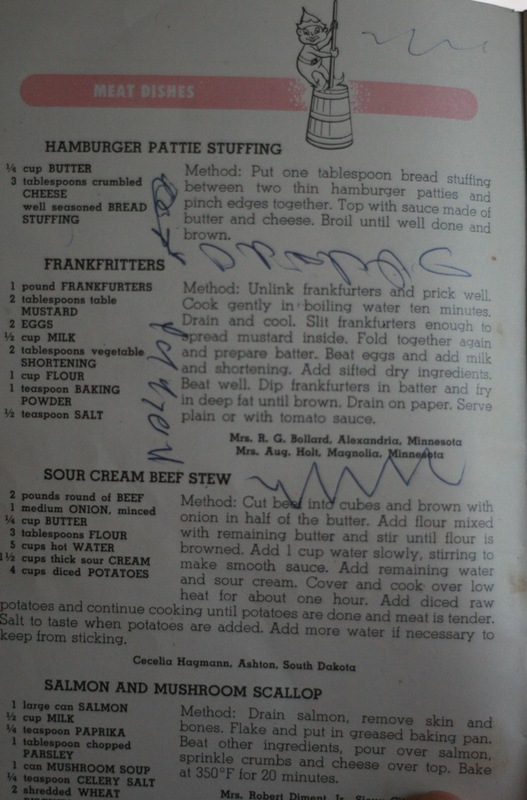 Sometimes the ladies who owned the cookbooks would write categories on the outside to remind themselves which cookbooks contained recipes they needed. Sometime in 1954, a lady wrote “freezing cukes” on the outside of her cookbook so she could remember how to preserve her garden produce. Simple, but it gives a little bit of familiarity to a book which would otherwise be, well, just a book. 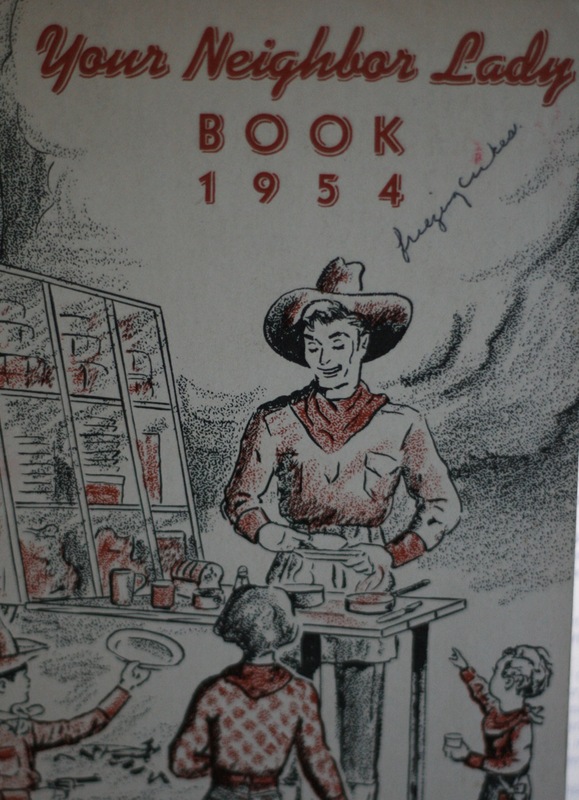 What possessed a woman to write a simple word — “charity” — inside of the back cover of her cookbook? The upside-down recipe is easy enough to guess. 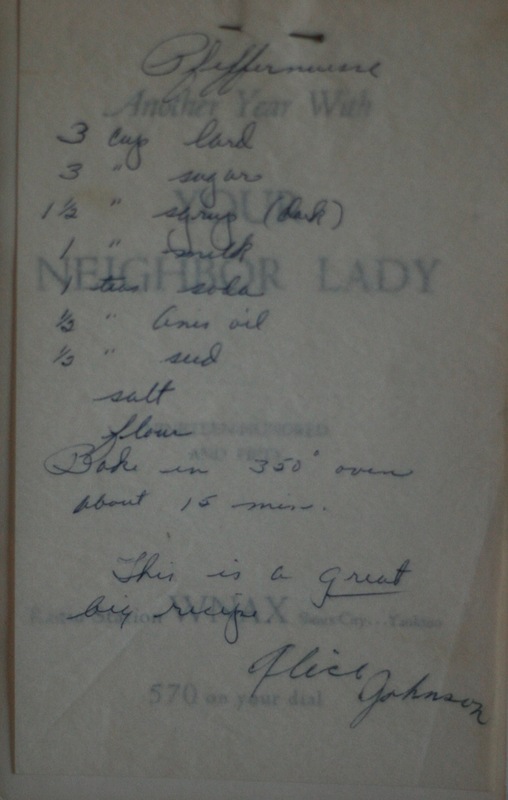 Since the Neighbor Lady show gave out lots of recipes over the air, I’m guessing she grabbed the nearest book and took down this recipe for waffles. I hope they were good. Did the woman who cut this out of a magazine (taking time to pin the picture to the recipe) ever actually make it? Did she take it along to the church potluck, or did it get stuck there one day, only to be forgotten? If she brought to church and the other ladies asked her for the recipe, did she admit that she found it in a magazine, or did she pretend that she just whipped it up at the last minute from her own creativity? Who cares? you may ask. Well, I do. I suppose part of this is the result of having an overactive imagination. Random pieces of writing and clippings get me thinking about who put them there . . . whether they were happy . . . what their dreams were . . . and what they were doing on the day when they left behind a little memento of ordinary life. 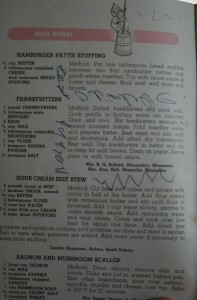 I wonder how Alice Johnson’s family enjoyed this pfeffernuesse recipe that she (or the recipient of this recipe) oh-so-carefully wrote on tissue paper and pinned to the inside cover of her 1950 Neighbor Lady book. Perhaps Alice Johnson took the image seriously. Must. Pin. Recipes. To. Book. 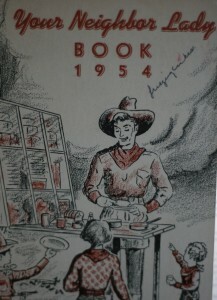 I wonder about the child who made these scribbles in the 1952 book. Did he/she get in trouble, or did the mom allow the scribbles to steal a few minutes of silence while she worked in the kitchen? Not that I would know about having that kind of day . . . (she said, as her kids fought over a Nerf gun in the background). 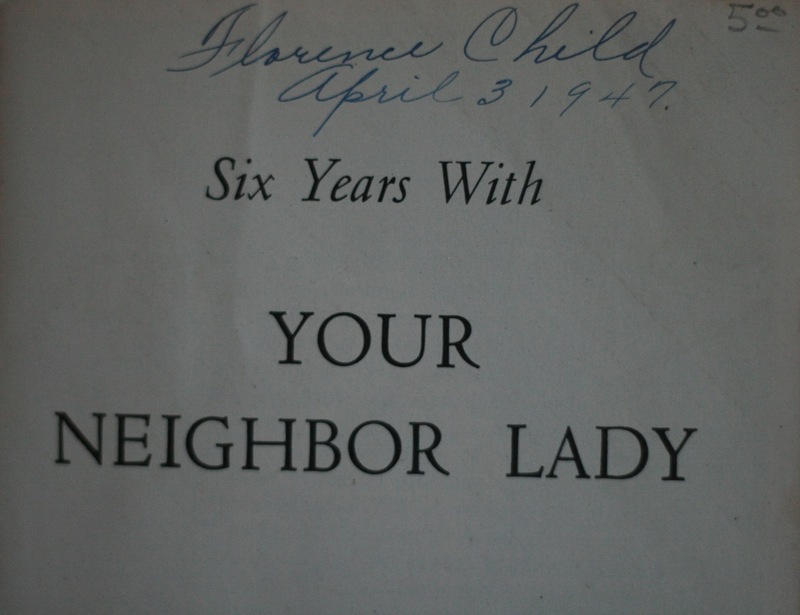 Who was Florence Child, and what was her life like on April 3, 1947? Was she a young wife who met her husband just after the war? Was she a mother who had to send a son off to fight? If so, did he come home? 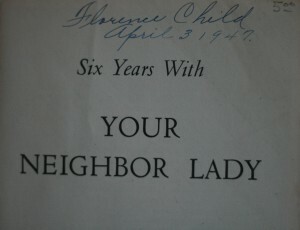 Did she sign her name and the date on all the Neighbor Lady books that she owned? See, the questions just keep on comin’. Perhaps the most treasured bit of writing is some I just recently discovered. I’m not sure why I never noticed it before, because I’ve had the book for years. 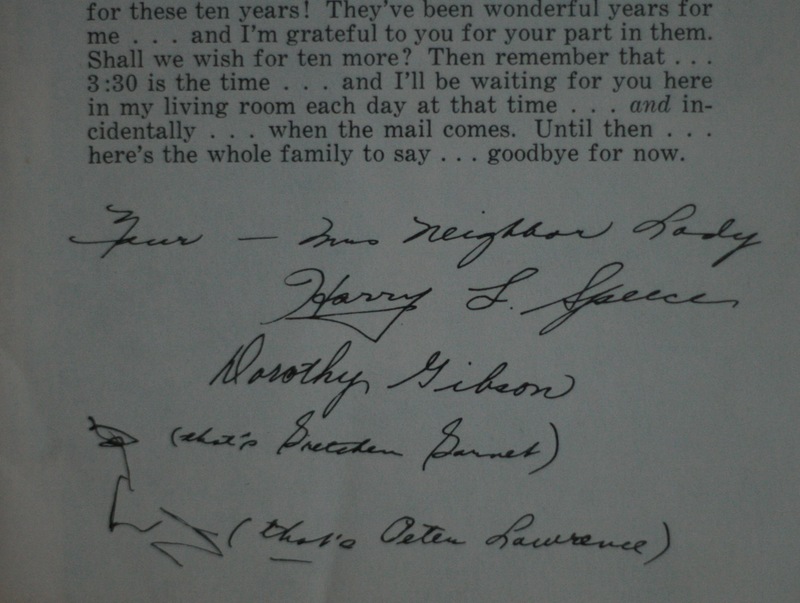 It’s the signature of the Neighbor Lady herself, along with the scribbles of her children. There she was, a working mother with young children, gaining fame every year as a champion of the homemaker, doing it all and still seeming to balance everything. It’s the best autograph of all. Have you ever read Fannie Flagg’s books? She did two or three in which one of the main characters is Neighbor Dorothy, a radio homemaker in a small town in Missouri. Like your Neighbor Lady she gave out recipes and news and was beloved for miles around. I bet she could figure out why your lady wrote Charity in her book! I am embarrassed to admit that I have never read a Fannie Flagg book, but you can be that is going to change as soon as I bring my current books to the library. If they don’t have books by her, then I’m turning to Amazon. Thanks for the tip! Out of all the writings I blogged about, the “charity” thing has me stumped. 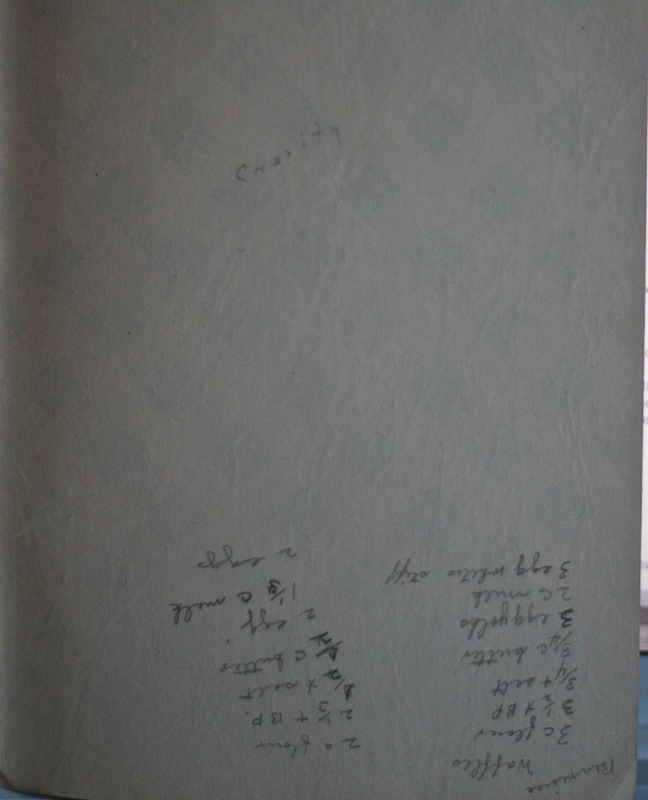 On the opposite page, the woman also drew a few sketches of bells. Christmastime? Cookie designs? Reminder of the time for giving? I dunno . . . I am stumped.